Archaeological evidence indicates that the coastal plain of ancient Libya was inhabited by Neolithic peoples from as early as 8000 BC, 10,000 b2k. The Ancient Libyans were skilled in the domestication of cattle and the cultivation of crops. The apparent origin and migration of hominins is traced in the mitochondrial descent of the prehistory of Africa in the map on the right from 200 kya to 55 kya (200,000 - 55,000 b2k). Map of the world is for the late Bronze Age, 1300 BC. Credit: Thomas Lessman. The bronze age history period began between 5,300 and 2,600 b2k. The "Scandinavian [end of the last ice age was] 2000 years earlier [8,000 b2k]." Iron and copper smelting appeared around the same time in most parts of Africa. As such, most Classical African civilizations outside of Egypt did not experience a distinct Bronze Age. Evidence for iron smelting appears earlier or at the same time as copper smelting in Nigeria c. 900–800 BC, Rwanda and Burundi c. 700–500 BC and Tanzania c. 300 BC. Evidence for copper smelting furnaces was found near Agadez, Niger that has been dated as early as 2200 BC. However, evidence for copper production in this region before 1000 BC is debated. Evidence of copper mining and smelting has been founded at Akjoujt, Mauretania that suggests small scale production c. 800 to 400 BC. Early settlement of Igboland (Southeastern Nigeria) dates back to 8,000 b2k based on early pottery work found in the Okigwe, Oka Igwe, and known today as Awka. Some local Villagers retain the Original name, like Umuzuoka, The Blacksmiths Ezioka, Okigwe, Imoka, etc. Oka ,igwe-Nsukka axis. There is, however, evidence of Palaeolithic man settling in southern Nigeria from at least 10,000 years ago. Much of the pottery excavated at Nsukka in 1978 uncovered a rock quarry which was a mine for tool and pottery making for a 'stone civilisation' nearby at Ibagwa. Fossils and use of monoliths date back to 8,000 b2k at Ugwelle-Uturu in the Okigwe area. Further evidence of ancient settlements were uncovered at a hypothesised Nsukka metal cultural area from 5000 b2k and later settlements attributed to Ngwa culture at 1992-1982 b2k. "In recent years, the German oak chronology has been extended to 7938 BC [9938 b2k]. For earlier intervals, tree-ring chronologies must be based on pine, because oak re-emigrated to central Europe at the Preboreal/Boreal transition, at about 8000 BC [10,000 b2k]." "The age range, 7145-7875 BC [9145-9875 b2k], is represented by the oak chronology, 'Main9'." "The age range, 7833-9439 BC [9833-11439 b2k], is covered by the 1784-yr pine chronology." On the right is a black and white photograph of a smaller Nsude pyramid, ancient Igbo pyramid, in Udi, Enugu state southeastern Nigeria. 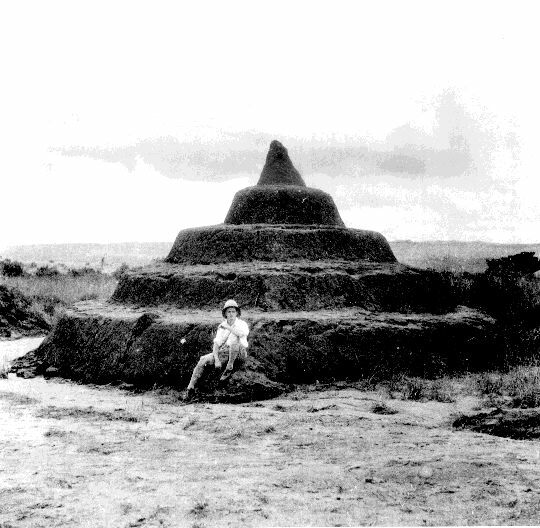 "In 1935, G. I. Jones, an anthropoligist and colonial administrator took pictures of the Nsude pyramids, ancient Igbo pyramids, in Udi, Enugu state Nigeria with a Roloflex camera which he acquired and developed a system for immediate developing which produced negatives of such high quality that they continue to produce excellent prints six decades later. It was at this time that he built up the extraordinary photographic record of Southeastern Nigerian culture." "The pyramids, numbering 10 [...] are circular and stepped and were made of clay." The original positive image made from Jones' negative for the image on the right is here: https://jonesarchive.siu.edu//wp-content/uploads/arunsi111.jpg. "The first base section was 60 ft. in circumference and 3 ft. in height. The next stack was 45 ft. in circumference. Circular stacks continued, till it reached the top. The structures were temples for the god Ala/Uto, who was believed to reside at the top. A stick was placed at the top to represent the god’s residence. The structures were laid in groups of five parallel to each other. Because it was built of clay/mud like the Deffufa of Nubia, time has taken its toll requiring periodic reconstruction." Algerian cave paintings depict hunting scenes. Credit: Helen Chapin Metz. "The Pre-boreal period marks the transition from the cold climate of the Late-glacial to the warmer climate of Post-glacial time. This change is immediately obvious in the field from the nature of the sediments, changing as they do from clays to organic lake muds, showing that at this time a more or less continuous vegetation cover was developing." "At the beginning of the Pre-boreal the pollen curves of the herbaceous species have high values, and most of the genera associated with the Late-glacial fiora are still present e.g. Artemisia, Polemomium and Thalictrum. These plants become less abundant throughout the Pre-boreal, and before the beginning of the Boreal their curves have reached low values." Domestication of sheep and goats reached Egypt from the Near East possibly as early as 6000 BC. "The first indisputable evidence for domestic plants and animals in the Nile valley is not until the early fifth millennium BC in northern Egypt and a thousand years later further south, in both cases as part of strategies that still relied heavily on fishing, hunting, and the gathering of wild plants. [... ] These subsistence changes were not due to farmers migrating from the Near East but was an indigenous development, with cereals either indigenous or obtained through exchange." Other scholars argue that the primary stimulus for agriculture and domesticated animals (as well as mud-brick architecture and other Neolithic cultural features) in Egypt was from the Middle East. Jebel Sahaba (also Site 117) is a prehistoric cemetery site in the Nile Valley (now submerged in Lake Nasser), near the northern border of Sudan, associated with the Qadan culture, dated to the Younger Dryas (some 12,000 to 14,000 years old). One skeleton was radiocarbon dated to approximately 13,140-14,340 years old. Newer apatite dates indicate that the site is at least 11,600 years old. The base of the Neolithic is approximated to 12,200 b2k, ending between 6500 and 4000 b2k. In regions such as Sub-Saharan Africa, the Stone Age was followed directly by the Iron Age. "Older Dryas [...] events [occurred about 13,400 b2k]". "The most negative δ 18O excursions seen in the GRIP record lasted approximately 131 and 21 years for the [inter-Allerød cold period] IACP and [Older Dryas] OD, respectively. The comparable events in the Cariaco basin were of similar duration, 127 and 21 years. In addition to the chronological agreement, there is also considerable similarity in the decade-scale patterns of variability in both records. Given the geographical distance separating central Greenland from the southern Caribbean Sea, the close match of the pattern and duration of decadal events between the two records is striking." In the figures on the right, especially b, is a detailed "comparison of δ 18O from the GRIP ice core24 with changes in a continuous sequence of light-lamina thickness measurements from core PL07-57PC. Both records are constrained by annual chronologies, although neither record is sampled at annual resolution. The interval of comparison includes the inter-Allerød cold period (12.9-13 cal. kyr BP) and Older Dryas (13.4 cal. kyr BP) events (IABP and OD from a). The durations of the two events, measured independently in both records, are very similar, as is the detailed pattern of variability at the decadal timescale." MIS Boundary 1/2 is at 14 ka. "The synchronous and nearly uniform lowering of snowlines in Southern Hemisphere middle-latitude mountains compared with Northern Hemisphere values suggests global cooling of about the same magnitude in both hemispheres at the [Last Glacial Maximum] LGM. When compared with paleoclimate records from the North Atlantic region, the middle-latitude Southern Hemisphere terrestrial data imply interhemispheric symmetry of the structure and timing of the last glacial/interglacial transition. In both regions atmospheric warming pulses are implicated near the beginning of Oldest Dryas time (~14,600 14C yr BP) and near the Oldest Dryas/Bølling transition (~12,700-13,000 14C yr BP). The second of these warming pulses was coincident with resumption of North Atlantic thermohaline circulation similar to that of the modern mode, with strong formation of Lower North Atlantic Deep Water in the Nordic Seas. In both regions, the maximum Bølling-age warmth was achieved at 12,200-12,500 14C yr BP, and was followed by a reversal in climate trend. In the North Atlantic region, and possibly in middle latitudes of the Southern Hemisphere, this reversal culminated in a Younger-Dryas-age cold pulse." "After c. 22 ka BP [which is] during the Jylland stade (Houmark-Nielsen 1989), Late Weichselian glaciers of the Main Weichselain advance overrode Southeast Denmark from the northeast and later the Young Baltic ice invaded from southeasterly directions. Traces of the Northeast-ice are apparently absent in the Klintholm sections, although large scale glaciotectonic structures and till deposits from this advance are found in Hjelm Bugt and Møns Klint (Aber 1979; Berthelsen 1981, 1986). At Klintholm, the younger phase of glaciotectonic deformation from the southeast and south and deposition of the discordant till (unit 9) were most probably associated with recessional phases of the Young Baltic glaciation. In several cliff sections, well preserved Late Glacial (c. 14-10 ka BP) lacustrine sequences are present (Kolstrup 1982, Heiberg 1991)." This glacial advance begins about 26 ka and ends abruptly at about 23.4 ka. "GIS 4 (start) 26.627 [to] GIS 4 (end) 26.339 ka BP". "GIS 6 (start) 31.218 [to] GIS 6 (end) 30.849 ka BP". The "Hengelo Interstadial [is] (38–36 ka ago)." Analyses of mitochondrial DNA have estimated that the recent African origin of modern humans, i.e., exodus from Africa, the major migration from Africa, occurred 60,000–70,000 years ago, consistent with dating of the Toba eruption to around 75,000 years ago. The populations of the Eastern African chimpanzee, Bornean orangutan, central Indian macaque, cheetah, and the tiger, all recovered from very low numbers around 70,000–55,000 years ago. The largest known volcanic eruption in the history of the human species did not significantly alter the climate of East Africa. "We examined smear slides at a 2-mm interval, corresponding to subdecadal resolution, and X-ray fluorescence scans run at 200-µm intervals correspond to subannual resolution. We observed no obvious change in sediment composition or Fe/Ti ratio, suggesting that no thermally driven overturn of the water column occurred following the Toba supereruption." There was "no significant cooling associated with Mount Toba". Cores from Lake Malawi dating to the period of the Toba supereruption showed no evidence of a volcanic winter, and there was no apparent effect on African humans. Evidence from a variety of studies shows that the Toba eruption did not have a major climatic effect or any effect on human numbers. kg) of erupted magma, of which 800 km³ was deposited as ash fall. The erupted mass was 100 times greater than that of the largest volcanic eruption in recent history, the 1815 eruption of Mount Tambora in Indonesia, which caused the 1816 "Year Without a Summer" in the Northern Hemisphere. Toba's erupted mass deposited an ash layer about 15 centimetres (5.9 in) thick over the whole of South Asia. A blanket of volcanic ash was also deposited over the Indian Ocean, and the Arabian Sea, and South China Sea. Deep-sea cores retrieved from the South China Sea have extended the known reach of the eruption, suggesting that the 2,800 km³ calculation of the erupted mass is a minimum value or even an underestimate. MIS Boundary 5.4 (peak) is at 109 ka. Some argue that cosmetic body art was the earliest form of ritual in human culture, dating over 100,000 years ago from the African Middle Stone Age. The evidence for this comes in the form of utilised red mineral pigments (red ochre) including crayons associated with the emergence of Homo sapiens in Africa. The "controversially split Eemian period, the predecessor of our own warm period [was] about 125,000 years ago." Stegodonts were present from 11.6 mya to late Pleistocene, with unconfirmed records of regional survival until 4,100 years ago. Fossils are found in Asian and African strata dating from the late Miocene. They lived in large parts of East and Central Africa during the Pleistocene. Yarmouthian spans 420,000-500,000 yr BP. Aftonian interglacial spans ca. 600,000-650,000 yr BP. "N tills [...] show the greatest amount of feldspar and carbonate minerals in the silt fraction. This group includes at least one till unit overlain by the 0.6 Ma Lava Creek ash, thus suggesting that some of these units were deposited between 0.8 and 0.6 Ma, but also later, as indicated by two sites with a till overlying the 0.6 Ma ash (Boellstorff, 1973). The N till group is considered to include the A1, A2, and A3 tills of Boellstorff (1973, 1978b)." Lava Creek B ash is dated at 602 ka. A notable modern human presence first appeared during the Middle Pleistocene in Africa. The magnetic field reversal to the present geomagnetic poles (Brunhes chron) occurred at 780,000 yr BP. "The R1-till group includes two till units that overlie the 1.3 Ma Mesa Falls ash, thus indicating at least two glaciations between 1.3 Ma and 0.8 Ma." The magnetic field reversal to the opposite geomagnetic poles (subchron) occurred at 900,000 yr BP. Other specimens from Sterkfontein Member 5 date to between 1.4 and 1.1 Ma, with the youngest specimens from Swartkrans Member 3 dated to sometime between 1.0 and 0.6 Ma. Mesa Falls ash is dated at 1293 ka. From the Konso Formation of Ethiopia, Acheulean hand-axes are dated to about 1.5 million years ago using radiometric dating of deposits containing volcanic ashes. From geological dating of sedimentary deposits, it appears that the Acheulean originated in Africa about 1.5 million years ago. The earliest accepted examples of the Acheulean currently known come from the West Turkana region of Kenya and were first described by a French-led archaeology team. These particular Acheulean tools were recently dated through the method of magnetostratigraphy to about 1.76 million years ago, making them the oldest not only in Africa but the world. The earliest user of Acheulean tools was Homo ergaster, who first appeared about 1.8 million years ago. The type specimen StW 53 from Sterkfontein is dated to sometime between 1.8 and 1.5 Ma. A specimen from Gondolin Cave is dated to ~1.8 Ma. The base of the marly layer overlying sapropel MPRS 250, located at 62 m in the Monte San Nicola section, is the defined base of the Gelasian Stage. Credit: D. Rio, R. Sprovieri, D. Castradori, and E. Di Stefano. The centre of human evolution and expansion, Africa and Asia were inhabited by advanced hominids by 2mya, with Homo habilis in Africa, and Homo erectus in both continents. By the advent and proliferation of Homo sapiens circa 298,000 BCE, dominant species included Homo heidelbergensis in Africa. Some number of N tills occurred during the Olduvai subchron. The magnetic field reversal to the present geomagnetic poles (Olduvai subchron) occurred at 2,000,000 yr BP. The oldest till group, R2 tills, consists of till units with a reversed polarity and >77% of sedimentary clasts. Low amounts of expandable clays, substantial amounts of kaolinite, and the absence of chlorite characterize the clay mineralogy of R2 tills. The mineralogy of the silt fraction of R2 tills is rich in quartz and depleted in calcite, dolomite, and feldspar. This till group includes a till unit that underlies the 2.0-Ma Huckleberry Ridge ash, thus indicating deposition sometime between ~2.5 Ma (onset of Northern Hemisphere glaciations) (Mix et al., 1995) and 2.0 Ma. The magnetic field reversal to the present geomagnetic poles (Reunion subchron) and back occurred at 2,080,000 yr BP. The magnetic field reversal to the present geomagnetic poles (Reunion subchron) and back occurred at 2,140,000 yr BP. "The astrochronological age of sapropel MPRS 250 (mid-point), corresponding to precessional cycle 250 from the present, is 2.588 Ma (Lourens et al., 1996), which can be assumed as the age of the boundary." Identification of H. gautengensis was based on partial skulls, several jaws, teeth and other bones found at various times and cave sites in the Cradle of Humankind. The oldest specimens are those from Swartkrans Member 1 (Hanging Remnant) between 1.9 and 1.8 Ma . The Quaternary is the current and most recent of the three periods of the Cenozoic Era in the geologic time scale of the International Commission on Stratigraphy (ICS). It follows the Neogene Period and spans from 2.588 ± 0.005 million years ago to the present. The Quaternary Period is divided into two epochs: the Pleistocene (2.588 million years ago to 11.7 thousand years ago) and the Holocene (11.7 thousand years ago to today). The informal term "Late Quaternary" refers to the past 0.5–1.0 million years. This is a Mode 1, or Oldowan, stone tool from the western Sahara. Credit: . The Piacenzian begins 3.6 Mya and lasts 1.01 million years. Archaeological discoveries in Kenya in 2015, identifying possibly the oldest known evidence of hominin use of tools to date, have indicated that Kenyanthropus platyops (a 3.2 to 3.5-million-year-old Pliocene hominin fossil discovered in Lake Turkana, Kenya in 1999) may have been the earliest tool-users known. The earliest documented stone tools have been found in eastern Africa, manufacturers unknown, at the 3.3 million year old site of Lomekwi 3 in Kenya. The oldest indirect evidence found of stone tool use is fossilised animal bones with tool marks; these are 3.4 million years old and were found in the Lower Awash Valley in Ethiopia. Oldowan tools were used during the Lower Paleolithic period, 2.6 million years ago up until 1.7 million years ago, by ancient hominids across much of Africa. The Zanclean begins 5.33 Mya and lasts for about 1.73 million years. Starting from about 4 million years ago (mya) a single biome established itself from South Africa through the rift, North Africa, and across Asia to modern China, which has been called "transcontinental 'savannahstan'" recently. Fossil cercopithecoids have been found in the Early Miocene of eastern Libya. Cercopithecoids are primates and from the parvordo Catarrhini as are humans, differing in superfamily: Cercopithecoidea versus Hominoidea. Zaltanpithecus occurred in eastern Libya. Prohylobates is from the Early Miocene of Libya. "Before the late Miocene, the published cercopithecoid record has largely been limited to rare and incomplete materials of Prohylobates and Zaltanpithecus collected from the early–middle Miocene of northern Africa". Fossils of Allocrioceras have been found in South Africa. Beudanticeras is an extinct cephalopod genus from the Late Cretaceous period; Albian and Cenomanian, belonging to the Ammonoidea subclass and included in the family Desmoceratidae. Beudanticeras has a rather to very compressed shell that is moderately involute, with convex to flat sides and a narrowly arched out rim. Coiling is such that the outer whorl embraces much of the next inner whorl, leaving a small spiraled umblicus. The shell is generally smooth but may have weak ribs but no tubercles. The suture is ammonitic. Other related genera include Beudantiella, Brewericeras, Zurcherella, and possibly Pseudosaynella. Fossils of Beudanticeras have been found in Angola, Egypt, Madagascar, Morocco, Mozambique, and South Africa. Cadomites is an extinct ammonite genus that lived during the Middle Jurassic (upper Bajocian – lower Callovian). Cadomites is directly descended from Stephanoceras, with a similar collared and lipped aperture rim, but has denser, finer, sharper ribbing. The shell is discoidal, evolute, with a wide umbilicus. The suture is complex. Fossils of species within this genus have been found in the Middle Jurassic sediments in Africa. Bettoniceras is genus of ammonite that lived during the Pliensbachian stage of early Jurassic and died out during Margaritatus zone. Fossils of this genus have been found in Morocco and Tunisia. Sometimes this genus is not considered valid but just a synonym of Prodactylioceras. Ammonites of this genus had serpenticone planulate shells with mostly single ribs and no tubercules. Whorl section was round. Only difference between Prodactylioceras and Bettoniceras is that the latter is missing tubercules. Acanthoclymenia forcipifer Sandberger & Sandberger, 1851: ca 378.7 - 376.9 mya is of Algeria. Species belonging to this genus lived in middle and late Devonian (upper Givetian - lower Frasnian). ↑ Federal Research Division of the Library of Congress, (1987), "Early History of Libya", U.S. Library of Congress. Retrieved 11 July 2006. ↑ "Karmah Archaeological site (The Sudan)". Britannica Inc. Retrieved 11 August 2014. ↑ Taylor, Francis. "Kingdoms of North Africa: Encyclopaedia of African History: Volume 1 A-G". The History Files. Retrieved 18 March 2014. ↑ 6.0 6.1 6.2 Miller, Duncan E.; van der Merwe, Nikolaas J. (1994). "Early Metal Working in Sub-Saharan Africa: A Review of Recent Research". The Journal of African History 35 (1): 1–36. doi:10.1017/s0021853700025949. ↑ 7.0 7.1 7.2 7.3 Childs, S. Terry (2008). "Metallurgy in Africa". In Selin, Helaine. Encyclopaedia of the History of Science, Technology, and Medicine in Non-Western Cultures. Netherlands: Springer. pp. 1596–1601. ISBN 978-1-4020-4425-0. Retrieved 30 March 2017. ↑ 8.0 8.1 8.2 8.3 8.4 Holl, Augustin F. C. (2009). "Early West African Metallurgies: New Data and Old Orthodoxy". Journal of World Prehistory 22: 415–438. doi:10.1007/s10963-009-9030-6. ↑ Alpern, Stanley B. (2005). "Did They or Didn't They Invent It? Iron in Sub-Saharan Africa". History in Africa 32: 41–94. doi:10.1353/hia.2005.0003. ↑ Killick, David (2009). "Cairo to Cape: The Spread of Metallurgy Through Eastern and Southern Africa". Journal of World Prehistory 22: 399–414. doi:10.1007/s10963-009-9025-3. ↑ Chirikure, Shadreck (2010). "On Evidence, Ideas and Fantasy: The Origins of Iron in Sub-Saharan Africa: Thoughts on É. Zangato & A.F.C. Holl's "On the Iron Front"". Journal of African Archaeology 8 (1): 25–28. doi:10.3213/1612-1651-10156. ↑ Chirikure, Shadreck (2010). "On Evidence, Ideas and Fantasy: The Origins of Iron in Sub-Saharan Africa: Thoughts on É. Zangato & A.F.C. Holl's "On the Iron Front"". Journal of African Archaeology 8 (1): 25. doi:10.3213/1612-1651-10156. ↑ 13.0 13.1 Childs, S. Terry; Killick, David (1993). "Indigenous African Metallurgy: Nature and Culture". Annual Review of Anthropology 22: 317–337. doi:10.1146/annurev.anthro.22.1.317. ↑ Killick, David; van der Merwe, Nikolaas J.; Gordon, Robert B.; Grebenart, Danilo (1988). "Reassessment of the Evidence for Early Metallurgy in Niger, West Africa". Journal of Archaeological Science 15: 367–3944. doi:10.1016/0305-4403(88)90036-2. https://doi.org/10.1016/0305-4403(88)90036-2. Retrieved 30 March 2017. ↑ Elizabeth, Isichei (1976). A History of the Igbo People. London: Macmillan. ISBN 0-333-18556-0. ; excerpted in "Cultural Harmony I: Igboland — the World of Man and the World of Spirits", section 4 of Kalu Ogbaa, ed., Understanding Things Fall Apart (Westport, Connecticut: Greenwood Press, 1999; ISBN 0-313-30294-4), pp. 83–85. ↑ 16.0 16.1 16.2 J. W. Franks and W. Pennington (April 1961). "The Late-Glacial and Post-Glacial Deposits of the Esthwaite Basin, North Lancashire". New Phytologist 60 (1): 27-42. http://onlinelibrary.wiley.com/store/10.1111/j.1469-8137.1961.tb06237.x/asset/j.1469-8137.1961.tb06237.x.pdf;jsessionid=EB6966DF0A2FBCC3534CCD6A6413808D.f02t01?v=1&t=i23es9k1&s=e619673cf5bc8be51450a303a914df03f8cba94d. Retrieved 2014-11-04. ↑ 17.0 17.1 17.2 Bernd Kromer and Bernd Becker (1993). "German Oak and Pine 14C Calibration, 7200-9439 BC". Radiocarbon 35 (1): 125-135. https://journals.uair.arizona.edu/index.php/radiocarbon/article/download/18069/17799#page=130. Retrieved 2017-10-13. ↑ 18.0 18.1 18.2 bigfrancis21 (17 February 2015). Ancient Igbo Pyramids: The Nsude Pyramids. Retrieved 24 June 2018. ↑ Linseele, V. (July 2010). "Sites with Holocene dung deposits in the Eastern Desert of Egypt: Visited by herders?". Journal of Arid Environments 74 (7): 818–828. doi:10.1016/j.jaridenv.2009.04.014. http://www.elenamarinova.net/publications/LinseeleMarinovaVanNeerVermeersch2009_JAE.pdf. ↑ Hays, Jeffrey (March 2011). EARLY DOMESTICATED ANIMALS. Retrieved 21 October 2013. ↑ Blench, Roger; MacDonald, Kevin C (1999). The Origins and Development of African Livestock. Routledge. ISBN 1-84142-018-2. ↑ Barker, Graeme (25 March 2009). The Agricultural Revolution in Prehistory: Why Did Foragers Become Farmers?. Oxford University Press. pp. 292–293. ISBN 978-0-19-955995-4. Retrieved 3 December 2011. ↑ Alexandra Y. Aĭkhenvalʹd; Robert Malcolm Ward Dixon (2006). Areal Diffussion and Genetic Inheritance: Problems in Comparative Linguistics. Oxford University Press, USA. p. 35. ISBN 978-0-19-928308-8. ↑ Fekri A. Hassan (2002). Droughts, food and culture: ecological change and food security in Africa's later prehistory. Springer. pp. 164–. ISBN 978-0-306-46755-4. Retrieved 3 December 2011. ↑ Shillington, Kevin (2005). Encyclopedia of African history: A-G. CRC Press. pp. 521–. ISBN 978-1-57958-245-6. Retrieved 3 December 2011. ↑ 26.0 26.1 Jan Mangerud (1987). W. H. Berger and L. D. Labeyrie, ed. The Alleröd/Younger Dryas Boundary, In: Abrupt Climatic Change (PDF). D. Reidel Publishing Company. pp. 163–71. Retrieved 2014-11-03. ↑ Antoine, Daniel; Zazzo, Antoine; Friedman, Renée (2013). "Revisiting Jebel Sahaba: new apatite radiocarbon dates for one of the Nile valley’s earliest cemeteries". American Journal of Physical Anthropology 150: 68. doi:10.1002/ajpa.22247. ↑ Dawn of Ancient Warfare. Ancient Military History. Retrieved December 17, 2011. ↑ Antoine, D.; Zazzo, A.; Freidman, R. (2013). "Revisiting Jebel Sahaba: New Apatite Radiocarbon Dates for One of the Nile Valley's Earliest Cemeteries". American Journal of Physical Anthropology Supplement 56: 68. ↑ S.J.S. Cookey (1980). Swartz, B.K. ; Dumett, Raymond E., eds. An Ethnohistorical Reconstruction of Traditional Igbo Society, In: West African Culture Dynamics: Archaeological and Historical Perspectives. Mouton de Gruyter. p. 329. ISBN 978-9027979209. Retrieved 3 June 2016. ↑ 31.0 31.1 31.2 Konrad A. Hughes, Jonathan T. Overpeck, Larry C. Peterson & Susan Trumbore (7 March 1996). "Rapid climate changes in the tropical Atlantic region during the last deglaciation". Diagonalarida 380: 51-4. http://www.diagonalarida.cl/SemV/Hughen_etal_1996_tropicalAtlantic.pdf. Retrieved 2014-11-05. ↑ 34.0 34.1 34.2 Michael Houmark-Nielsen, (30 November 1994). "Late Pleistocene stratigraphy, glaciation chronology and Middle Weichselian environmental history from Klintholm, Møn, Denmark". Bulletin of the Geological Society of Denmark 41 (2): 181-202. http://2dgf.dk/xpdf/bull41-02-181-202.pdf. Retrieved 2014-11-03. ↑ 36.00 36.01 36.02 36.03 36.04 36.05 36.06 36.07 36.08 36.09 36.10 36.11 36.12 Barbara Wohlfarth (April 2010). "Ice-free conditions in Sweden during Marine Oxygen Isotope Stage 3?". Boreas 39: 377-98. doi:10.1111/j.1502-3885.2009.00137.x. http://people.su.se/~wohlf/pdf/Wohlfarth%20Boreas%202010.pdf. Retrieved 2014-11-06. ↑ 37.00 37.01 37.02 37.03 37.04 37.05 37.06 37.07 37.08 37.09 37.10 37.11 37.12 37.13 37.14 Sasha Naomi Bharier Leigh (2007). A STUDY OF THE DYNAMICS OF THE BRITISH ICE SHEET DURING MARINE ISOTOPE STAGES 2 AND 3, FOCUSING ON HEINRICH EVENTS 2 AND 4 AND THEIR RELATIONSHIP TO THE NORTH ATLANTIC GLACIOLOGICAL AND CLIMATOLOGICAL CONDITIONS (PDF). St Andrews, Scotland: University of St Andrews. p. 219. Retrieved 2017-02-16. ↑ Catherine Brahic (8 August 2014). Human exodus may have reached China 100,000 years ago. New Scientist. Retrieved 2014-08-16. ↑ New 'Molecular Clock' Aids Dating Of Human Migration History. 22 June 2009. Retrieved 2009-06-30. ↑ Goldberg, T.L. (1996). "Genetics and biogeography of East African chimpanzees (Pan troglodytes schweinfurthii)". Harvard University, unpublished. ↑ Steiper, M.E. (2006). "Population history, biogeography, and taxonomy of orangutans (Genus: Pongo) based on a population genetic meta-analysis of multiple loci". Journal of Human Evolution 50: 509–522. doi:10.1016/j.jhevol.2005.12.005. PMID 16472840. ↑ Hernandez, R.D. ; Hubisz, M.J.; Wheeler, D.A. ; Smith, D.G. ; Ferguson, B. et al. (2007). "Demographic histories and patterns of linkage disequilibrium in Chinese and Indian Rhesus macaques". Science 316: 240–243. doi:10.1126/science.1140462. PMID 17431170. ↑ Luo, S.-J. ; Kim, J.-H.; Johnson, W.E. ; Van der Walt, J.; Martenson, J. et al. (2004). "Phylogeography and genetic ancestry of tigers (Panthera tigris)". PLoS Biology 2 (12): 2275–2293. doi:10.1371/journal.pbio.0020442. PMID 15583716. PMC 534810. //www.ncbi.nlm.nih.gov/pmc/articles/PMC534810/. ↑ 46.0 46.1 46.2 46.3 46.4 46.5 46.6 46.7 46.8 46.9 Sam L. VanLandingham (May 2010). "Use of diatoms in determining age and paleoenvironment of the Valsequillo (Hueyatiaco) early man site, Puebla, Mexsico, with corroboration by Chrysophyta cysts for a maximum Yarmouthian (430,000-500,00yr BP) age of the artifacts". Nova Hedwigia 136: 127-38. http://www.pleistocenecoalition.com/vanlandingham/VanLandingham_2010b.pdf. Retrieved 2017-06-11. ↑ "Doubt over 'volcanic winter' after Toba super-eruption. 2013". Phys.org. 2013-05-02. Retrieved 2013-08-05. ↑ Lane, CS; Chorn, BT; Johnson, TC (2013). "Ash from the Toba supereruption in Lake Malawi shows no volcanic winter in East Africa at 75 ka" (PDF). Proceedings of the National Academy of Sciences 110 (20): 8025–8029. doi:10.1073/pnas.1301474110. PMID 23630269. PMC 3657767. http://www.pnas.org/content/110/20/8025.full.pdf. Retrieved 2015-03-28. ↑ Lane, CS (2013). "Reply to Roberts et al. : A subdecadal record of paleoclimate around the Youngest Toba Tuff in Lake Malawi". Proceedings of the National Academy of Sciences 110 (33): E3048. doi:10.1073/pnas.1309815110. PMC 3746898. http://www.pnas.org/content/110/33/E3048.full. ↑ Jackson, LJ; Stone, JR; Cohen, AS; Yost, CL (2015). "High-resolution paleoecological records from Lake Malawi show no significant cooling associated with the Mount Toba supereruption at ca. 75 ka". Geology 43 (9): 823–826. doi:10.1130/G36917.1. ↑ Yost, Chad (March 2018). "Subdecadal phytolith and charcoal records from Lake Malawi, East Africa imply minimal effects on human evolution from the ∼74 ka Toba supereruption". Journal of Human Evolution (Elsevier) 116. https://www.sciencedirect.com/science/article/pii/S0047248417302750. Ninkovich, D.; N.J. Shackleton; A.A. Abdel-Monem; J.D. Obradovich; G. Izett (7 December 1978). "K−Ar age of the late Pleistocene eruption of Toba, north Sumatra". Nature 276 (5688): 574–577. doi:10.1038/276574a0. .
Rose, W.I. ; Chesner, C.A. (October 1987). "Dispersal of Ash in the Great Toba Eruption, 75 ka". Geology 15 (10): 913–917. doi:10.1130/0091-7613(1987)15<913:DOAITG>2.0.CO;2. http://www.geo.mtu.edu/~raman/papers/RoseTobaFallGeology.pdf. .
Chesner, C.A. ; Westgate, J.A. ; Rose, W.I. ; Drake, R.; Deino, A. (March 1991). "Eruptive History of Earth's Largest Quaternary caldera (Toba, Indonesia) Clarified". Geology 19: 200–203. doi:10.1130/0091-7613(1991)019<0200:EHOESL>2.3.CO;2. http://www.geo.mtu.edu/~raman/papers/ChesnerGeology.pdf. , p. 200; Jones, S. C. (2007). Petraglia, M. D.; Allchin, B., eds. The Toba Supervolcanic Eruption: Tephra-Fall Deposits in India and Paleoanthropological Implications, In: The Evolution and History of Human Populations in South Asia. Springer. pp. 173–200. ISBN 1-4020-5561-7. , p. 174; Oppenheimer, Clive (August 2002). "Limited global change due to largest known Quaternary eruption, Toba ≈74 kyr BP?". Quaternary Science Reviews 21 (14-15): 1593–1609. doi:10.1016/S0277-3791(01)00154-8. http://www.sciencedirect.com/science/article/pii/S0277379101001548. , pp. 1593–1594; Ninkovich, D.; N.J. Shackleton; A.A. Abdel-Monem; J.D. Obradovich; G. Izett (7 December 1978). "K−Ar age of the late Pleistocene eruption of Toba, north Sumatra". Nature 276 (5688): 574–577. doi:10.1038/276574a0. Rose, W.I. ; Chesner, C.A. (October 1987). "Dispersal of Ash in the Great Toba Eruption, 75 ka". Geology 15 (10): 913–917. doi:10.1130/0091-7613(1987)15<913:DOAITG>2.0.CO;2. http://www.geo.mtu.edu/~raman/papers/RoseTobaFallGeology.pdf. , p. 913; Zielinski, G.A. ; Mayewski, P.A. ; Meeker, L.D. ; Whitlow, S.; Twickler, M.S. ; Taylor, K. (1996). "Potential Atmospheric Impact of the Toba Mega‐Eruption ~71,000 years ago". Geophysical Research Letters 23 (8): 837–840. doi:10.1029/96GL00706. https://web.archive.org/web/20110718080436/http://faculty.jsd.claremont.edu/dmcfarlane/Joyce/Mulu%20ash/Zielinski__Atmospheric%20effetcs.pdf. Retrieved July 18, 2011. .
↑ Oppenheimer, Clive (August 2002). "Limited global change due to largest known Quaternary eruption, Toba ≈74 kyr BP?". Quaternary Science Reviews 21 (14-15): 1593–1609. doi:10.1016/S0277-3791(01)00154-8. http://www.sciencedirect.com/science/article/pii/S0277379101001548. , p. 1593. ↑ Jones, S. C. (2007). Petraglia, M. D.; Allchin, B., eds. The Toba Supervolcanic Eruption: Tephra-Fall Deposits in India and Paleoanthropological Implications, In: The Evolution and History of Human Populations in South Asia. Springer. pp. 173–200. ISBN 1-4020-5561-7. , p. 174; Rose, W.I. ; Chesner, C.A. (October 1987). "Dispersal of Ash in the Great Toba Eruption, 75 ka". Geology 15 (10): 913–917. doi:10.1130/0091-7613(1987)15<913:DOAITG>2.0.CO;2. http://www.geo.mtu.edu/~raman/papers/RoseTobaFallGeology.pdf. , p. 913. ↑ Jones, S. C. (2007). Petraglia, M. D.; Allchin, B., eds. The Toba Supervolcanic Eruption: Tephra-Fall Deposits in India and Paleoanthropological Implications, In: The Evolution and History of Human Populations in South Asia. Springer. pp. 173–200. ISBN 1-4020-5561-7. , p. 114; Zielinski, G.A. ; Mayewski, P.A. ; Meeker, L.D. ; Whitlow, S.; Twickler, M.S. ; Taylor, K. (1996). "Potential Atmospheric Impact of the Toba Mega‐Eruption ~71,000 years ago". Geophysical Research Letters 23 (8): 837–840. doi:10.1029/96GL00706. http://faculty.jsd.claremont.edu/dmcfarlane/Joyce/Mulu%20ash/Zielinski__Atmospheric%20effetcs.pdf. , p. 837. ↑ Jones, S. C. (2007). Petraglia, M. D.; Allchin, B., eds. The Toba Supervolcanic Eruption: Tephra-Fall Deposits in India and Paleoanthropological Implications, In: The Evolution and History of Human Populations in South Asia. Springer. pp. 173–200. ISBN 1-4020-5561-7. , p. 174; Oppenheimer, Clive (August 2002). "Limited global change due to largest known Quaternary eruption, Toba ≈74 kyr BP?". Quaternary Science Reviews 21 (14-15): 1593–1609. doi:10.1016/S0277-3791(01)00154-8. http://www.sciencedirect.com/science/article/pii/S0277379101001548. . pp. 1593–1596. ↑ H. Saegusa (8 May 2006). Comparisons of Stegodon and Elephantid Abundances in the Late Pleistocene of Southern China, In: The World of Elephants (PDF). Rome: Second International Congress. pp. 345–349. ↑ 66.0 66.1 66.2 66.3 66.4 66.5 M. Roy, P.U. Clark, R.W. Barendregt, J.R. Glasmann, and R.J. Enkin (January/February 2004). "Glacial stratigraphy and paleomagnetism of late Cenozoic deposits of the north-central United States". Geological Society of America Bulletin 116 (1/2): 30-41. doi:10.1130/B25325.1. http://geo.oregonstate.edu/files/geo/Royetal-GSAB-2004.pdf. Retrieved 2017-06-16. ↑ Chris Stringer and Julia Galway-Witham (2017). "Palaeoanthropology: On the origin of our species". Nature 546 (7657): 212–214. doi:10.1038/546212a. http://www.nature.com/doifinder/10.1038/546212a. ↑ Goren-Inbar, N.; Feibel, C. S.; Verosub, K. L.; Melamed, Y.; Kislev, M. E.; Tchernov, E.; Saragusti, I. (2000). "Pleistocene Milestones on the Out-of-Africa Corridor at Gesher Benot Ya'aqov, Israel". Science 289 (5481): 944–947. doi:10.1126/science.289.5481.944. PMID 10937996. ↑ Scott, G. R.; Gibert, L. (2009). "The oldest hand-axes in Europe". Nature 461 (7260): 82–85. doi:10.1038/nature08214. PMID 19727198. ↑ National Geographic (7 June 2017). These Early Humans Lived 300,000 Years Ago—But Had Modern Faces. National Geographic. Retrieved 2017-10-13. ↑ D. Rio, R. Sprovieri, D. Castradori, and E. Di Stefano (June 1998). "The Gelasian Stage (Upper Pliocene): A new unit of the global standard chronostratigraphic scale". Episodes 21 (2): 82-7. http://www.stratigraphy.org/GSSP/Gelasian.pdf. Retrieved 2015-01-20. ↑ Pickering et al. 2011, "Contemporary flowstone development links early hominin bearing cave deposits in South Africa" Earth and Planetary Science Letters 306 (1-2) , pp. 23-32. ↑ 82.0 82.1 82.2 Cohen, K.M. ; Finney, S.C.; Gibbard, P.L. ; Fan, J.-X. International Chronostratigraphic Chart 2013 (PDF). ICS. Retrieved 15 June 2014. ↑ Denton, G.H. ; Anderson, R.F. ; Toggweiler, J.R.; Edwards, R.L. ; Schaefer, J.M. ; Putnam, A.E. (2010). "The Last Glacial Termination". Science 328 (5986): 1652–1656. doi:10.1126/science.1184119. ↑ Lowe, J.J.; Walker, M.J.C. (1997). Reconstructing Quaternary Environments. Routledge. ISBN 0582101662. ↑ Sonia Harmand et al. (21 May 2015). "3.3-million-year-old stone tools from Lomekwi 3, West Turkana, Kenya". Nature 521: 310–315. doi:10.1038/nature14464. PMID 25993961. ↑ Barham, Lawrence; Mitchell, Peter (2008). The First Africans: African Archaeology from the Earliest Toolmakers to Most Recent Foragers. Oxford: Oxford University Press. ↑ B. R. Benefit (2008). "The biostratigraphy and paleontology of fossil cercopithecoids from eastern Libya". Geol. East Libya 3: 247–66. ↑ E. Delson (1979). "Prohylobates (Primates) from the Early Miocene of Libya: A new species and its implications for cercopithecid origins". Geobios 12: 725–33. ↑ Nancy J. Stevens, Erik R. Seiffert, Patrick M. O’Connor, Eric M. Roberts, Mark D. Schmitz, Cornelia Krause, Eric Gorscak, Sifa Ngasala, Tobin L. Hieronymus & Joseph Temu (30 May 2013). "Palaeontological evidence for an Oligocene divergence between Old World monkeys and apes". Nature 497 (7451): 611-4. doi:10.1038/nature12161. http://www.indiaenvironmentportal.org.in/files/file/fossil.pdf. Retrieved 2014-06-12. ↑ 97.0 97.1 Jack Sepkoski (2002). "A compendium of fossil marine animal genera (Cephalopoda entry)". Bulletins of American Paleontology 363: 1–560. https://web.archive.org/web/20160225225905/http://strata.geology.wisc.edu/jack/showgenera.php?taxon=231&rank=class. Retrieved 2008-05-07. ↑ 98.0 98.1 Paleobiology Database - Cadomites. Retrieved 2017-10-19. ↑ Wiedenmayer (1977). †Bettoniceras, In: Paleobiology Database. Fossilworks. Retrieved 28 March 2017. ↑ Christian Meister, Jean-Louis Dommergues, Cyril Dommergues, Nadifa Lachkar, Khadija El Hariri (2011). "Les ammonites du Pliensbachien du jebel Bou Rharraf (Haut Atlas oriental, Maroc) (Pliensbachian ammonites from the jebel Bou Rharraf (eastern High Atlas, Morocco))" (in fr). Geobios 44 (1): 117.e1–117.e60. doi:10.1016/j.geobios.2010.06.006. ↑ M. K. Howarth 2013. Treatise on Invertebrate Paleontology, Part L, Revised, Volume 3B, Chapter 4: Psiloceratoidea, Eoderoceratoidea, Hildoceratoidea. This page was last edited on 25 June 2018, at 05:11.